The Street Profits VS Tino Sabbatelli & Riddick Moss; The Street Profits win. Kairi Sane VS Peyton Royce w/ Billie Kay; Kairi wins. Mustache Mountain VS Pete Dunne & Mark Andrews; Mustache Mountain wins. NXT comes to you from the Aztec Theatre in San Antonio! 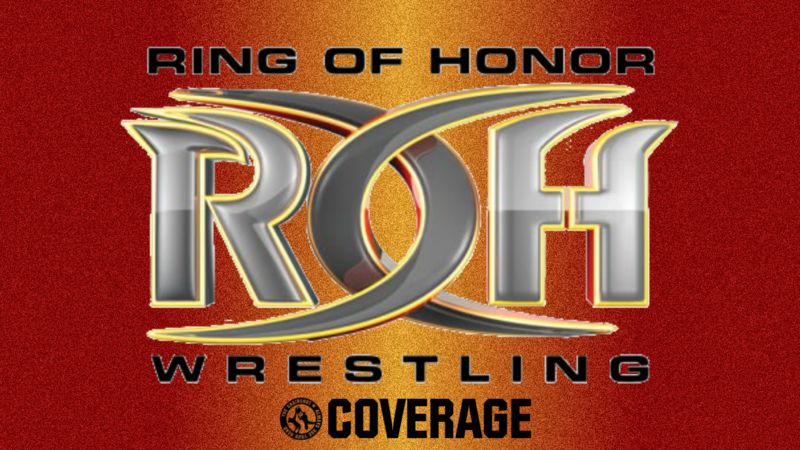 Over 90 years of history, and now it can add being host to WWE’s increasingly popular developmental promotion to its illustrious resume. Angelo Dawkins & Montez Ford have had issues with the Blue Chip Boys, and are 1-0 on them from their first match, can they make it a 2-0 sweep in San Antonio? Starting off are Dawkins and Moss, tie up and the Curse of Greatness gets Moss in a corner. Clean break but then Moss shoves Dawkins before slipping out of the ring. Dawkins waits for him to return, Moss slips in and gets a waistlock, takedown, then they go around until Dawkins gets the standing switch and a couple takedowns. Fans want a third, Moss denies at first with a standing switch, but switch back and Dawkins hits the hat trick! Moss gets up, elbows out, runs and runs Dawkins over. Scoop slam, then trash talk, but Dawkins kicks Moss away. Headlock but Moss powers out, Dawkins hurdles over Moss then runs over Moss, scoop slam and tag to Ford. 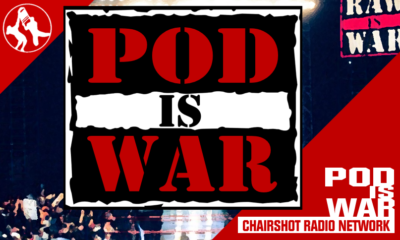 Ford slingshost in, pumps up, human weapon: back suplex splash! TWO, but Ford is on Moss with the headlock. Moss endures, tags to Tino, powers out and Tino goes up to then crossbody Ford, taunting and trash talking instead of covering. Ford kip-up and hip swivel, things speed up, Ford jumps up and over Tino a couple times, dropkick drops him down. Moss comes in, double flapjack and then double clothesline! The Street Profits and San Antonio are fired up as we take a break. We return, Ford avoids Moss’ clothesline on the apron to Penalty Kick him down, but then Tino forearms Ford off the apron to join Moss on the floor. Tino goes out to fetch Ford, getting him back in the ring, mounted right hands. More trash talk and more right hands, Tino will not be embarrassed by someone who “can’t afford our lifestyle.” Hard whip into the Blue Chip corner, tag to Moss, and Ford gets the assisted whip forearm smash and shoulder tackle. The Blue Chip Boys show off their secret handshake before Moss stands over Ford and shows off his own hip swivel. Moss brings Ford up as fans boo and jeer, stiff right hand drops Ford. Moss mocks Dawkins, fans rally for Ford, Ford revives to chop away at Moss. Moss shoves and runs Ford over, cover, TWO. Ford takes more right hands from Moss, unable to guard himself. Fans rally again as Ford is put in a chinlock, Ford flails and reaches for ropes. Ford feeds off the chants for the Profits, fights out with body shots, but Moss turns him around. Back suplex escaped, but tag denied by Moss’ power. Ford in a corner, Moss rushes in, Ford dodges and Moss hits buckles! A hard crash has Moss down, Ford crawls to his corner. Moss tags Tino, tag to Dawkins, Dawkins rallies on Tino! Big dropkick, and then a big uppercut for Moss. Things keep moving, big bulldog for Tino! Dawkins runs in, spinning splash for Tino. Spinning splash for Moss, but then Tino elbows Dawkins back. Dawkins responds with a hard right to Tino, but Moss breaks the pin. Moss blasts Ford off the apron to isolate Dawkins. Dawkins fights both of them off, then throws Moss out. Standing switch between Dawkins and Tino, Okana Roll, TWO and into a forearm from Moss! Cover, but the referee catches Moss blocking Dawkins’ feet from the ropes. No legal pin now, but the Blue Chip Boys protest. Ford takes care of this, apron cannonball on Moss! Tino is in shock, Dawkins gets him but standing switch, tag to Ford, spinebuster! Ford up, frog splash! 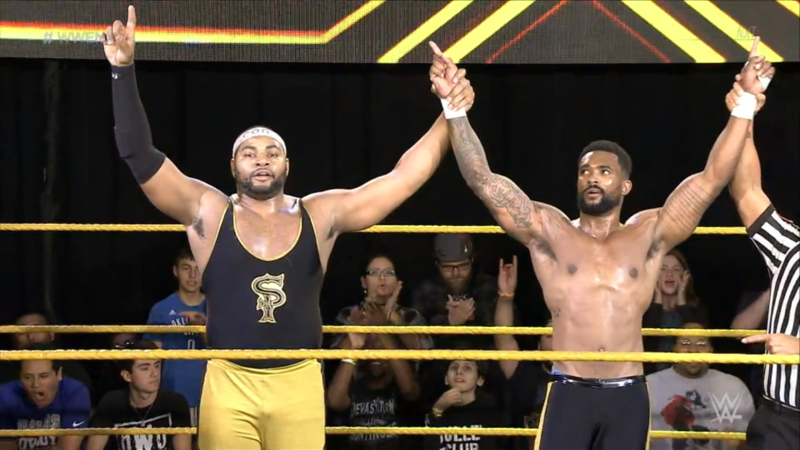 Street Profits win! They go up 2-0, can they go all the way to the top? Backstage interview with Mustache Mountain. Trent Seven & Tyler Bate of the WWE UK Division challenged WWE UK Champion, Pete Dunne, to a tag team match to see if anyone can still trust the Bruiserweight. Turns out someone does, as Mark Andrews is volunteering. Seven is surprised, as Wolfgang got “it handed to him” at the hands of the Undisputed Era. Dunne only cared about himself and his title, that didn’t sit too well with the others. They’re going to teach Dunne a lesson, and unfortunately Andrews will just be in the crossfire. Can Dunne and Andrews keep things together to overcome Mustache Mountain? Backstage interview with Mark Andrews. 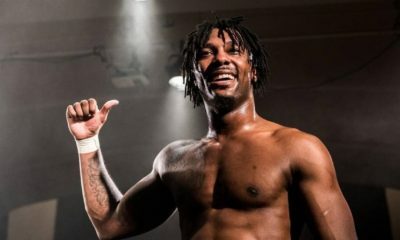 The High-Fiving, Stage-Diving superstar of the UK Division explains that he stepped up because he goes a ways back with Dunne, good and bad. He’s not here to be friends, he’s here to get Dunne to name him the next #1 Contender. Stakes raised, can Andrews rise to the challenge? Kairi Sane VS Peyton Royce w/ Billie Kay! 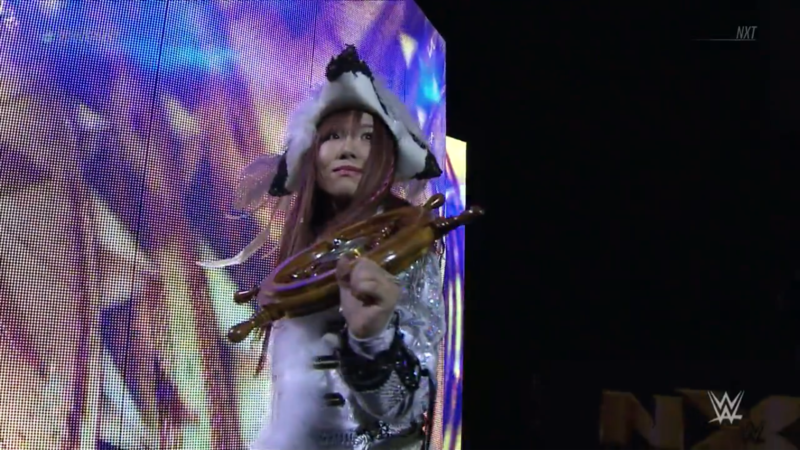 The Pirate Princess and #Iconic Venus Flytrap didn’t win the NXT Women’s Championship back at NXT TakeOver: WarGames, but that won’t slow them down. They battle each other to not only settle personal grudges but to see who moves closer to becoming the next #1 contender to the title now held by Ember Moon. The bell rings, the two stare down, remembering their TakeOver match-up. They tie up, taller Peyton spins Kairi around for a hard right elbow to Kairi’s head. Peyton whips Kairi, big hip toss but Kairi gets right up. Another whip, Kairi counters this second hip toss and makes it a wheelbarrow victory roll, TWO! Peyton runs Kairi over with a shoulder, things speed up, Peyton stops because she sees what Kairi is doing. Kairi dares her to keep going, they do, Kairi springboards and headscissors before dropkicking Peyton down, TWO. Peyton gets to ropes, Kairi grabs a hold of her, Peyton kicks her away. Billie swipes at Kairi, Kairi turns around into Peyton’s spinning heel kick! Cover, TWO, the Iconic Duo is frustrated. Billie keeps Peyton focused as Peyton stomps and clubs Kairi down. Peyton brings Kairi up, Kairi counters with a small package, TWO, Peyton runs Kairi over again. The Pirate Princess is in trouble as we go to break. We return to Peyton thrashing Kairi in a chinlock. Fans rally, Peyton shakes her head no as Kairi gets up. Kairi rolls Peyton, TWO, Peyton kicks Kairi down again. Peyton trash talks, whips Kairi to a corner, Kairi dodges and Peyton hits a buckle. Peyton keeps pursuit but Kairi fights back to bump Peyton off another buckle. Kairi is firing up, Interceptor SPEAR! Both women are down from exhaustion, fans rally as Billie is concerned for Peyton. Kairi blocks and returns a stiff forearm, then another, running blockbuster! Peyton gets to a corner as Kairi fires up and marches. Fans are rallying as Kairi runs corner to corner, sliding elbow! As Peyton crawls away, Billie warns her what’s coming, Peyton dodges Kairi’s jumping attack to then give Kairi a wicked knee to the side of the head! Cover, TWO! The Iconic Duo is shocked! Billie tells Peyton to finish this, she brings Kairi up but Kairi blocks the leg and trips Peyton up, ax kick after ax kick and then some stomps and clubbing forearms. Billie gets on the apron and shouts for Kairi to stop beating up her friend, so Kairi gives Billie a shoulder to send her off the apron! Kairi returns to Peyton, climbing up and taking aim. Fans fire up as Kairi drops anchor, InSane Elbow! Kairi wins! That’s a sweep on the Iconic Duo, can the inaugural Mae Young Classic winner set sail into the #1 contender’s spot? NXT leads the way in the Women’s (R)Evolution again! Sonya Deville may be helping Raw find Absolution, and Ruby Riot may be leading a Squad on SmackDown, but they’re not done with each other yet. 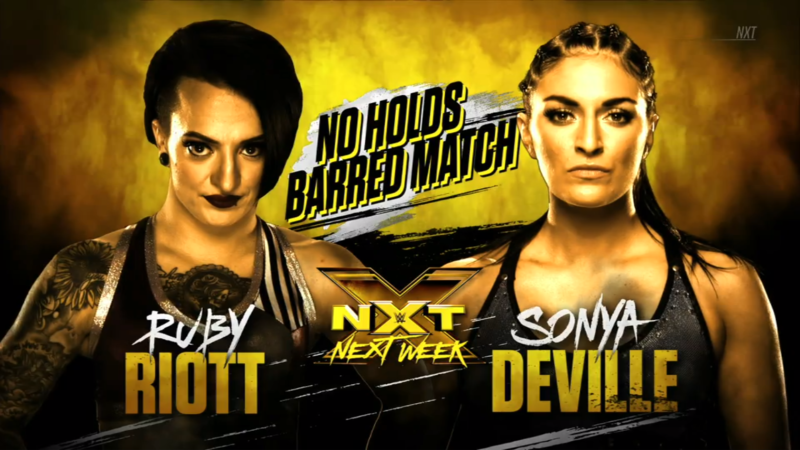 To say good-bye to NXT as well as each other next week, Ruby and Sonya will be in NXT’s first ever Women’s No Holds Barred match! Who will get the final W before going full-time in WWE’s main roster? 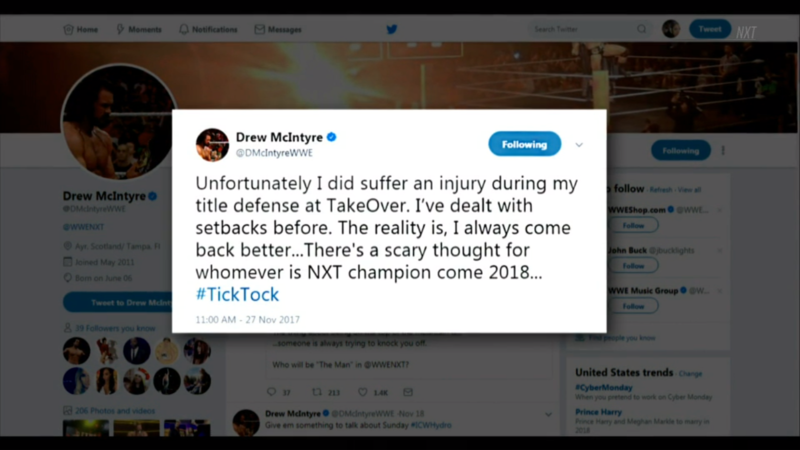 Update on Drew McIntyre’s condition. As he tweeted out himself, he is indeed out with injury to his bicep all the way until some time in 2018. And also as he said, whoever is NXT Champion come his return better be ready for an even better Celtic Colossus. 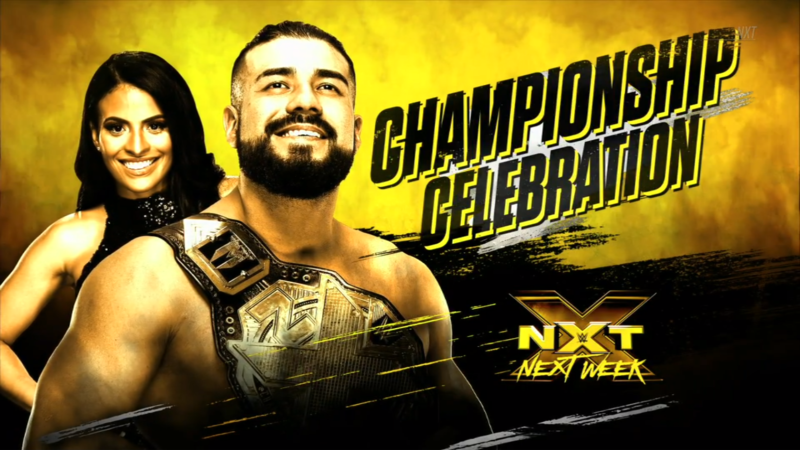 El Idolo and Zelina Vega promise a fiesta next week! Whether it is rightly deserved or not, will someone decide to crash the party? Mustache Mountain VS Pete Dunne & Mark Andrews! 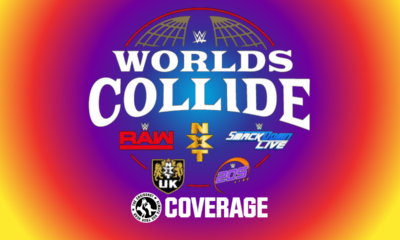 British Strong Style hits San Antonio and NXT as Trent Seven & Tyler Bate face the WWE UK Champion and his ambitious partner. Will Dunne learn his lesson? Or will Andrews earn his title shot? Dunne wants to start and so does Bate, a rivalry renewed as the bell rings. The fans chant “UK! UK! UK!” as the two tie up, waistlock takedown from Dunne, float to front facelock. Dunne keeps hold as Bate rolls, Bate rolls and covers, ONE, double kip-up into a staredown. It’s Dunne that backs down, fans cheer for the Bruiserweight, he fakes a tag to sucker punch Bate with a stiff forearm to the face. Now a tag to Andrews, hand-off and cravat on Bate. Bate rolls through the snapmare and snapmares Andrews, who handsprings onto his feet, things speed up and Bate shows his own agility, big dropkick drops Andrews! 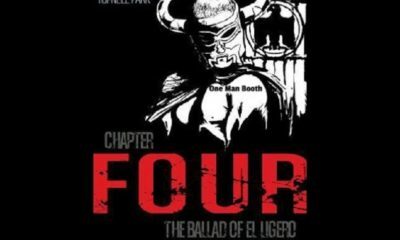 Handspring then a European uppercut, tag to Seven for the fireman carry into Wasteland Slam. Bate on the corner, he jumps and uses Seven to spin him into the senton on Andrews! Seven covers, TWO, but Seven stays on Andrews. Whip to a corner, Andrews goes up and over and then ducks, sunset flip flipped through, dropkick to cover, TWO. Andrews grabs Seven in an armlock, fans duel as Dunne tags in. 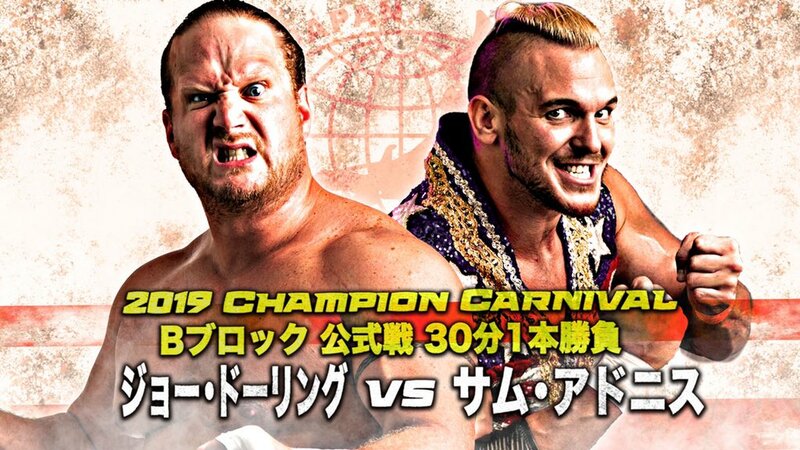 Bruiserweight tortures Seven’s fingers on both hands, Seven tries to fight out but the joint manipulation is a bit much. Seven uses his free hand to break and then chop, chop, fake chop to DDT! Cover, TWO, but Seven stays on Dunne. He brings Dunne up, Dunne gets free and gives Seven a stiff back elbow. Tag to Andrews, the ref didn’t see it so it doesn’t count, but that’s fine, Dunne uses it at as opening for a sucker punch forearm on Seven! Down goes Seven, Andrews can’t believe how he’s being used by his tag partner. Fans love it though, and chant for the Bruiserweight as we take a break. Back again, and Dunne tortures Seven again, but Andrews is reluctant to tag in. Hand-off on that armlock, Andrews gives a leg drop on the arm, TWO. Andrews stands Seven up to then wrench his arm again, fans rally and Seven feeds off the energy to get up. Andrews whips him into the corner, Seven boots him away and then gives a shot to Dunne. Seven catches Andrews’ monkey flip but Dunne tags back in, Seven carries Andrews out as Dunne comes in, and finds himself inside a double-knee sandwich! TWO, and Dunne is a bit surprised. 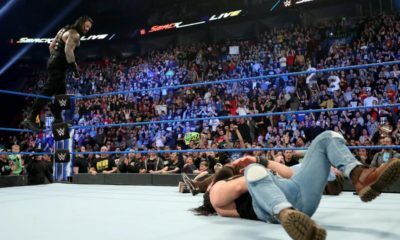 He stomps away on Seven, Seven grows stronger with every stomp, but then Dunne brings him down for a hammerlock and arm torture before giving double knees to that battered back. Seven reaches for Bate, Dunne drags him around the other way. Andrews tags in, Dunne didn’t like that, but Andrews wrenches and then Dunne tags in with authority. He tells Andrews to get out of the way, he goes after Seven with more toying kicks. Dunne brushes Andrews off, Seven swings Dunne out for the Seven Star Lariat! Fans rally as Seven crawls for a tag. Tag made, Bate comes in, Dunne catches his boot, but Bate slips his foot out of the hold to then give Dunne a stiff knee. Dunne is staggered, and is knocked down by Bate’s flying EuroUpper! Bate is fired up as he runs corner to corner, EuroUpper! Corner to corner reversed, Dunne runs in but is caught, Exploder! Kip-up from young Bate, standing shooting star! TWO!! Dunne is furious, but fans are loving this! Dunne glares at the writhing Bate, toying with him as he slaps and stomps him. 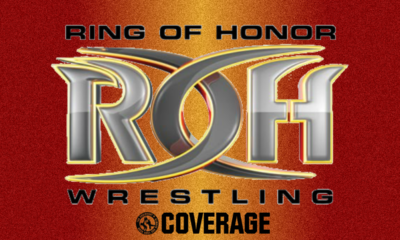 Fans want them to “Fight Forever!” Bate revives, Bop up, BANG! Dunne takes that sharp right hand and goes down, but Bate is too tired for a cover. They crawl to their corners, fans are rallying, hot tag to Seven but not Andrews, Seven runs in to hit a Snap Dragon Suplex! Tag back to Bate, Mustache Mountain hits Dunne with a back suplex bomb! Jackknife cover from Bate, Andrews breaks it up. Andrews waits for Dunne, Seven comes in, Dunne passes that back hand onto Bate, then enziguris Seven out of the ring, only for Bate to rebound with the rolling kick! Dunne is dazed, crawls for Andrews but Bate pursues, deadlift but Dunne tags Andrews! German suplex but Dunne’s not legal, Andrews flies in with a moonsault! Direct hit, cover, TWO! Andrews is shocked and frustrated, he goes up top now. Shooting Star, but Bate has moved, so Andrews bails out and rolls through, runs back, fireman’s carry for the airplane spin! Around and around, Bate slows down, Dunne tags in, and then rolls a dizzy Bate up, TWO! Stiff forearm rocks Bate, he’s thrown to the ropes but Bate hits a rebound lariat! Bate fired up again, double underhook, Tyler Driver ’97!! Mustache Mountain wins! 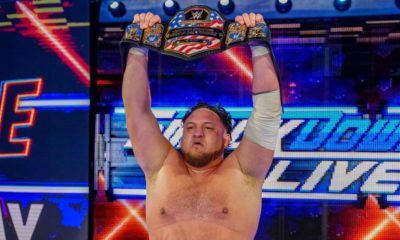 Sorry, Andrews, your title shot isn’t coming just yet. However, with this big win, will Seven or Bate earn a shot for themselves? Frustrated as he is, Andrews still shows sportsmanship to Dunne. Dunne, not so much! A forearm to the back of the head takes Andrews down! Dunne glares at Andrews as he writhes in the corner, the UK Champion takes his leave. Or so we think, as Dunne rushes back into the ring to drag Andrews up and give him the Bitter End! Now Dunne is done, and he takes his title back. 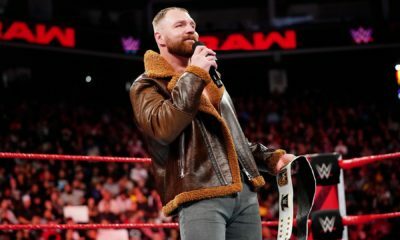 Andrews may not be next in line to challenge for it, but who will step up to The Bruiserweight for that WWE UK Championship? An incredible night for NXT outside of Full Sail. A smaller venue and therefore a smaller crowd, but still a very hot one that knows quality when they see it. 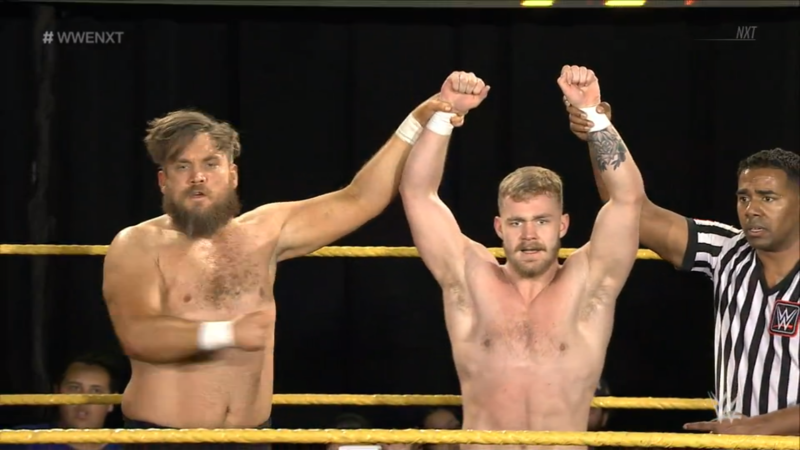 Great opening showing for the Profits and the Blue Chip Boys, Dawkins & Ford go 2-0 on them, which will make a good case for them to become #1 Contenders if the Heel reDRagon become the NXT Tag Team Champions in the near future. Otherwise, I fear they’ll just end up spinning their wheels in the tag-team midcard like Heavy Machinery. Really great match between Kairi and Peyton, and of course the MYC winner goes over to keep herself strong now that we’re in a new phase of the NXT Women’s Division. The Iconic Duo is just fine taking losses, I sense they’re destined for bigger things, like helping found a Women’s Tag Team Division, or at least reviving the LayCool Rule for the Women’s Championship by being co-owners with their own individual belts. And great to hear that we’re getting a high level blow-off match for Ruby and Sonya to give credence to how tough and merciless they are on the main roster. And I loved the UK Division tag team main event! Even if Andrews’ motivation was copied from when Wolfgang once teamed with Dunne, tonight’s match was on a different level. 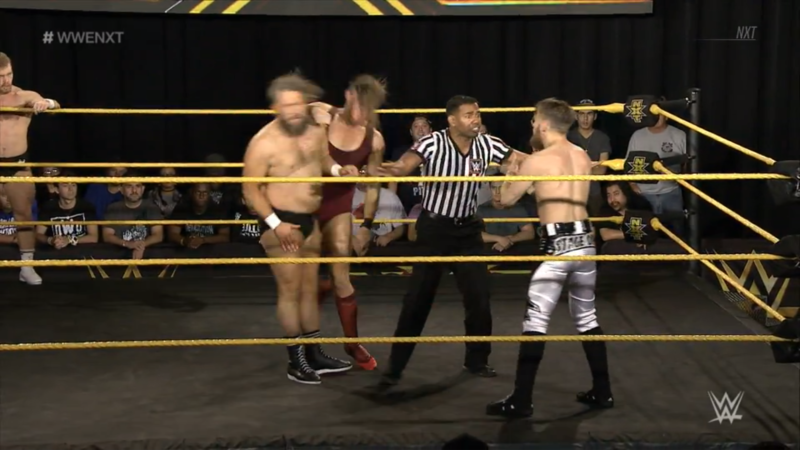 Great combinations from both teams, and even greater story as Dunne would go back and forth between accepting Andrews as an equal and using him for his own ends. Mustache Mountain wins because Dunne has to keep character of not getting along with anyone, but even in a loss, a decision might be made to still give Andrews a title shot, and hopefully on something WWE provides so we can all watch it on the Network.